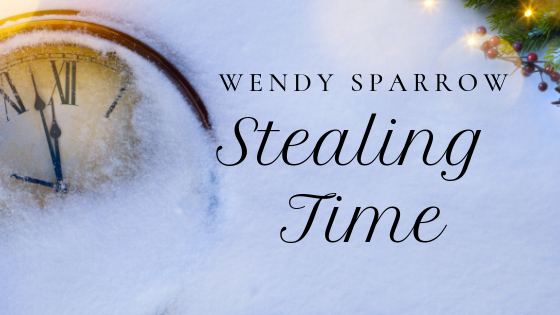 Stealing Time — Is this the story for you? Here’s an idea, read the first chapter below. That will give you an idea as to whether this book is a good fit for you even before you spend the time to download it. Hannah Lyons was living a charmed life—she’d escaped death thirty-seven times in the last three hundred and fifty-seven days. But Time was about to catch up to her—Time or, in German, Zeit, was nearly upon her… and about to give Hannah back her scarf which she’d dropped nearly as many times as he’d saved her life. She was relatively short with probably average features. He’d never really tried to tell mortals apart until he’d met Hannah. Chances were, few of the people she saw today would think she was anything out of the ordinary. She was ordinary and then she also wasn’t. Not to him. To him, she was as different and as delicate as a snowflake and just as beautiful. It was irritating as hell. He lifted her up by grabbing her waist—which put her mouth in close proximity to his—something he could ignore, if he concentrated. Her soft, shoulder-length hair brushed his lips, and he blew it out of the way as he carried her farther away from the curb and the lady with the yappy dog. He’d moved her quite a lot this last year, sometimes for great distances. She was seeing a mortal doctor about that—if only she knew that was the least of her worries. She’d gone to see Hoover Dam and nearly caused a bloodbath. “You’ve got a week,” he told her, setting her down on her feet like a giant posed doll. She could be a doll—with her cheeks rosy like this, and her eyes glassy from the bite of the cold air. One more week should be long enough to get her out of his system, and that was what he was going to do. No more slipping into the shadows of her life. 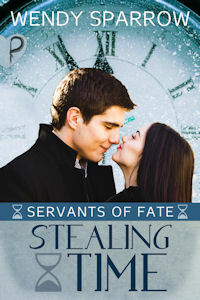 He’d see what made her so singular and beautiful—reason out why she’d captivated him, and then on New Year’s Eve, at midnight, he’d steal the rest of her hours as he’d been assigned to do almost a year ago. He brushed a finger along her cheek, even as he felt the push of hours. They shoved at his back like a strong gust of wind. Time wanted to march on. But he was master here. For now. Though that might end if he didn’t kill Hannah this time. The year end’s sacrifice demanded a lifetime and, last year, fortune had favored him with that heart attack a few feet from his Hannah as she’d been counting down the minutes at the ski lodge. The Fates had not been amused by the substitution. Snippy old bats. He traced her jaw. She did look like a doll. Even those puffy red lips of hers belonged on a porcelain figurine. His gaze shifted from mortal to mortal around her. There had to be someone else more interesting and less… marked for death. But no. Just Hannah. The others slipped from his thoughts as he looked away—their features indistinct memories of noses, eyes, lips and so on, whereas he could spot Hannah a mile away from behind. Admittedly, she did look good from behind. Zeit stared for one last mortal minute into those dark brown eyes of hers. This was insane. He was insane. “Stay out of trouble, Hannah.” He tucked a strand of hair behind her ear—he liked her ears. Every day, there was more and more about her he liked. It was a shame. A damn shame. In a general sense, time was not on her side but today, Time definitely was, in fact he wanted to be wrapped all around her. But, in eight days, he’d kill her at midnight and the Fates would let another year go by without damning everyone’s luck. He stepped back from her and, after one last shake of his head, walked away and snapped his fingers again. It was impossible not to glance back over his shoulder—she had that much of a hold on him. Her gaze met his. She narrowed her eyes. Zeit stared back. He was memorable and they’d bumped into each other one too many times for her to believe it to be a coincidence. Nodding, he winked at her before turning and going on his way, leaving a very irate Hannah swearing as she wrestled with why she was hopping from location to location. It couldn’t be helped, not if he was going to keep her alive long enough to steal her life. “Jeanie, you think I’m crazy, don’t you?” Honestly, if she didn’t, she might be the only one. “What does that matter?” Seriously, the whole thing was freaky. Hannah stabbed her straw into her vanilla shake. Why on earth had she gotten a milkshake when it was a million below zero outside? Hannah stopped jabbing her milkshake to give her friend a flat glare of death. “He wasn’t there a second before, and I wasn’t there. I was near the curb, and there was this woman carrying a tiny dog, coming straight at me. And then I was next to the window with my scarf back around my neck and him there. He winked at me before walking off. And that’s not the first time he’s been around lately with my… episodes.” Outside of the doctors, Jeanie was the only one who knew about how bad this was getting. Jeanie sipped the steaming hot chocolate she’d bought. Hot chocolate was so much smarter. Plus, it was the day before Christmas and so the last day she was allowed to have candy cane hot chocolate. What had she been thinking? Ugh. Her life was a series of bad choices lately. “So, at least he returned your scarf,” Jeanie said finally. Hannah groaned and dropped her head onto the wrought iron table in the mall food court. The food court décor was meant to convince them they were outside, somewhere tropical, not in Idaho in December. Lush greenery hung all around, spruced up with an occasional red ribbon or white twinkling lights. Too-small café tables were wedged tightly together so all of Boise could be in the mall today doing last minute shopping or supporting their best friends who were doing last minute shopping. A toddler wearing a plush velvet dress screamed her way by them, carried by a mother who looked on the verge of running as if the child was a live grenade. The little girl screeched at the mall stand-in Santa like he was Satan. People around shifted and looked away. Well that made her feel better. Being both crazy and having a medical condition would fit the pattern of her life this year. She wanted to bang her head against the table, but she settled for closing her eyes and pretending it was after Christmas. Christmas was a heinous time of year. It was a time for families. It was aggravating—she might have a father out there who would have liked being a father if he’d known a random hook-up had created her. Hannah shrugged. It was hard to put into words, but the place was like being in a family, without having to participate and with none of the drama. “Maybe your mysterious vampire hunter will follow you up there, and you can give him a place to hammer his… wait, never mind, there are kids around. Pretend I didn’t say that.” They both glanced around at the people who were practically sitting on their laps—it was so crowded. “It’s weird that I keep seeing him. He’s not there before I lose time and then he is… and he’s always walking away. The doctors mentioned that some people get like auras or something. Maybe he’s my brain’s gift to make up for dropping the ball.” Here you go, Hannah, have this hot stud of a hallucination. All around them, conversation stopped, and several parents looked appalled. Hannah cheeks heated-up—the first time they’d been warm all day.